L.J. 's been begging me for over a week to make my recipe for Fully Loaded Nachos, so we made Nachos instead of Taco's for Taco Tuesday. 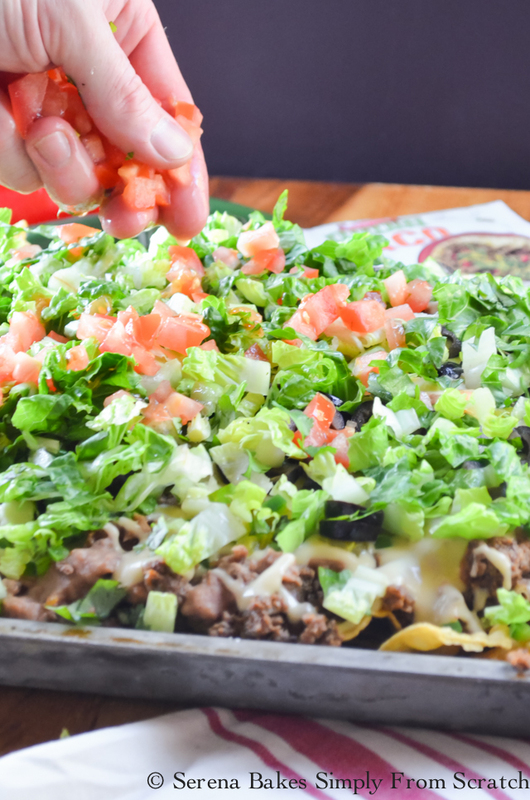 So I guess we had Nacho Tuesday, it might be a new thing in our house because I've already had multiple requests to have Fully Loaded Nachos again. 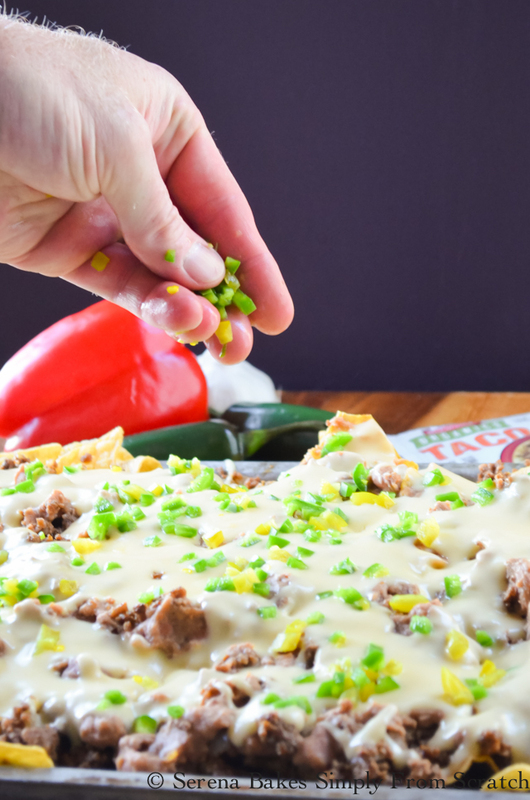 Fully Loaded Nachos are super simple to make and great for those busy weeknights with the kids back-to-school, the whole family will love! We also love these for an easy lunch on the weekend. It's a super simple meal packed with plenty of flavor! 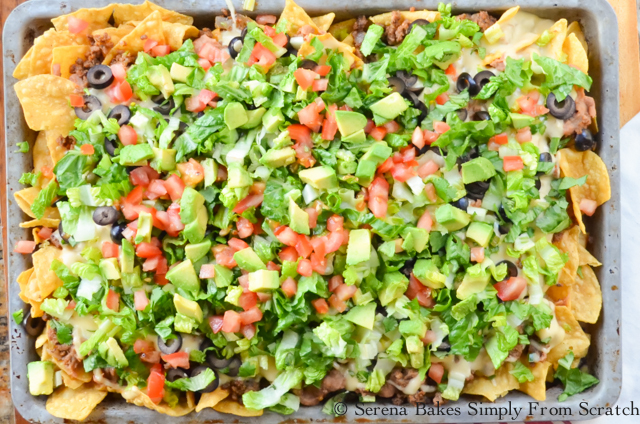 For these Fully Loaded Nachos I used McCormick's New Organics Taco Seasoning Mix. 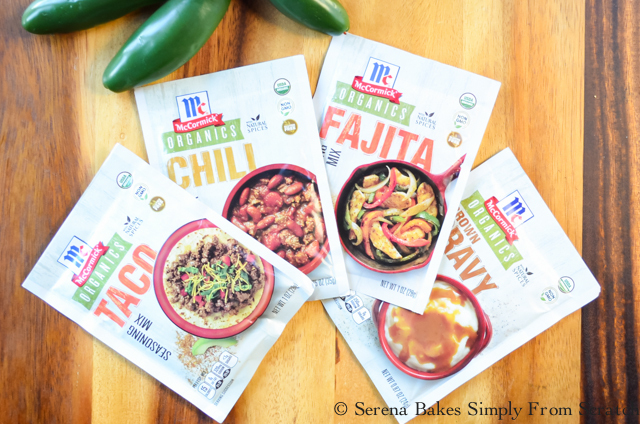 All of their New Organic Recipe Mixes are conveniently packaged, certified organic, and non-GMO seasoning mixes. The new recipe mixes come in four family favorite flavors, Taco Seasoning Mix, Chili Seasoning Mix, Fajita Seasoning Mix, and Brown Gravy Mix. 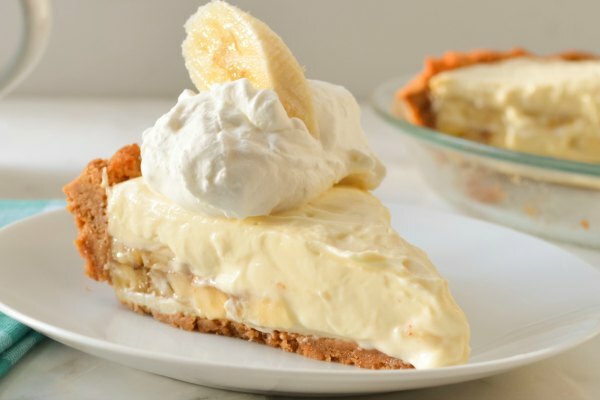 They make it easy to help families forget the ready-made meals and takeout menus, and create simple, flavorful one dish dinners the whole family will enjoy! I know we love 'em! You can find more wholesome dinners with McCormick's New Organic Seasoning Mixes on their website! 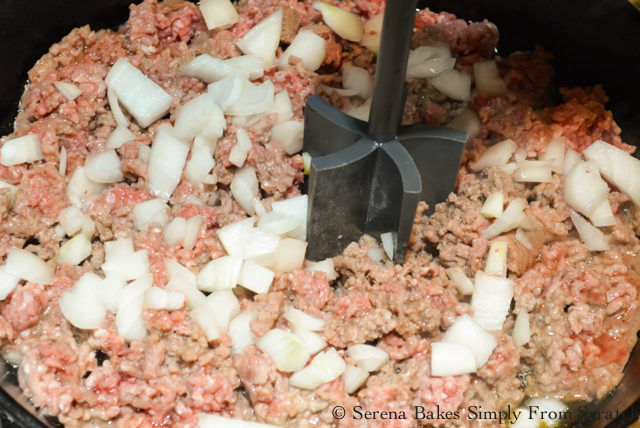 In a large skillet brown 1 pound Ground Beef and 1 medium sized Diced Onion over medium-high heat. Drain off excess fat. 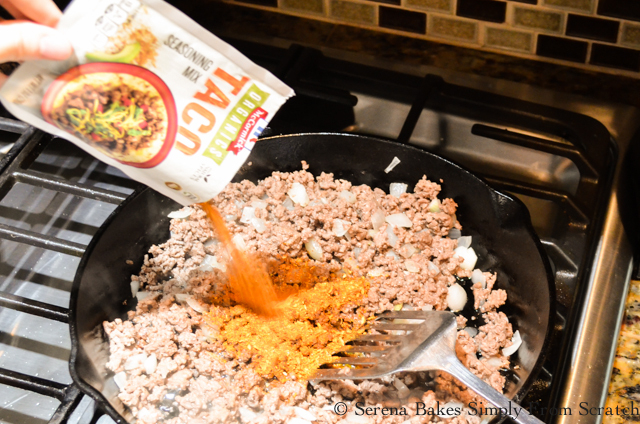 Stir in 1 package McCormick's Organics Taco Seasoning Mix and 3/4 cup Water. Bring to a boil. Reduce heat to low and simmer for 5 minutes stirring occasionally. 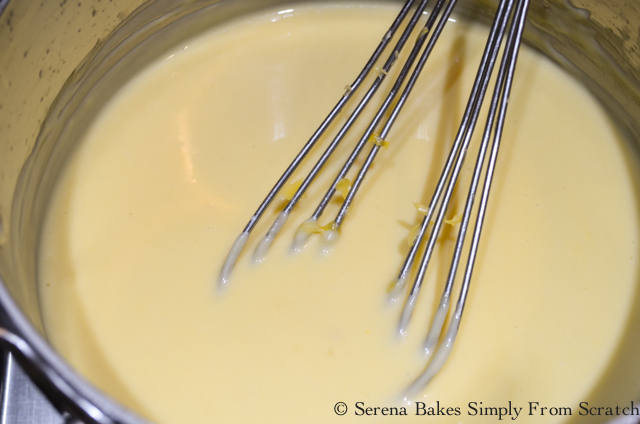 To make the Nacho Cheese Sauce in a small sauce pan over medium-high heat add 2 tablespoons Butter and stir until melted. 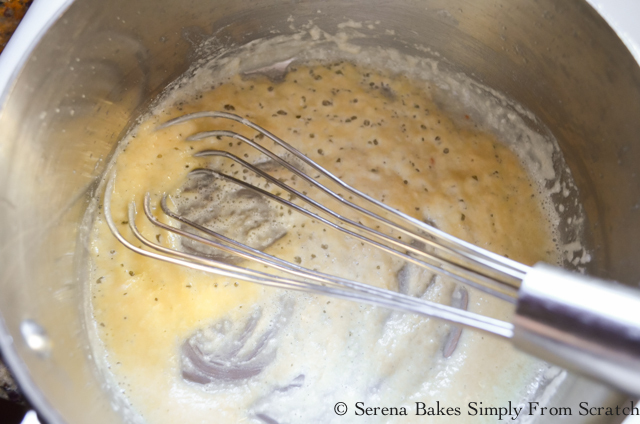 Whisk in 2 tablespoon All-Purpose Flour and cook until flour starts to bubble. Slowly stir in 3/4 cup Chicken Stock. Then stir in 3/4 cup Milk. 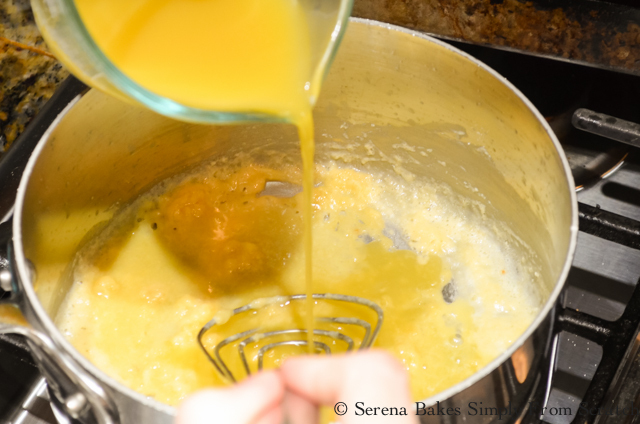 Bring to a simmer and stir until thickened about 2-3 minutes. Remove from heat and stir in 2 cups Grated Cheddar Cheese. 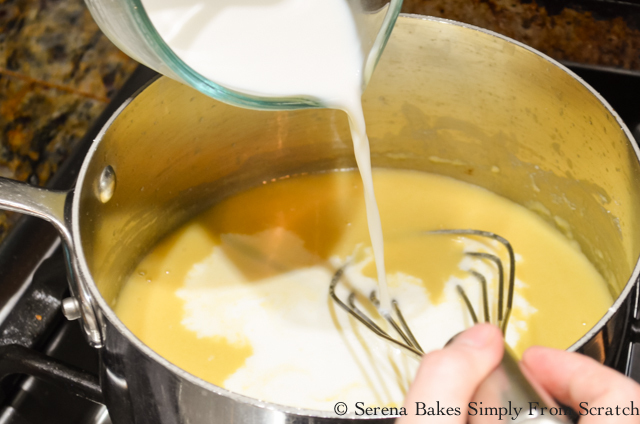 Whisk until cheese is melted. For Spicy Nacho Cheese Sauce whisk in 2 tablespoons Finely Diced Pickled Jalapeños. 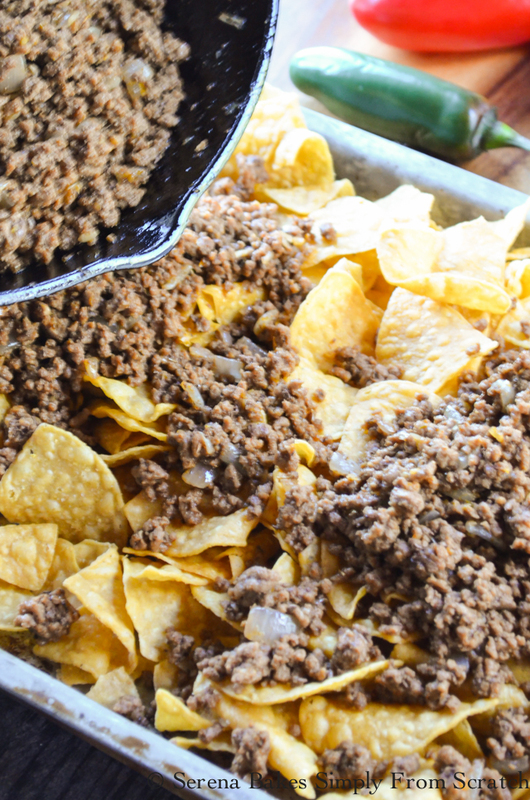 Fill a large rimmed baking sheet with your favorite Tortilla Chips and cover with Taco Seasoned Ground Beef. Cover Ground Beef with 16 ounces Heated Refried Beans or drained and rinsed Black Beans. 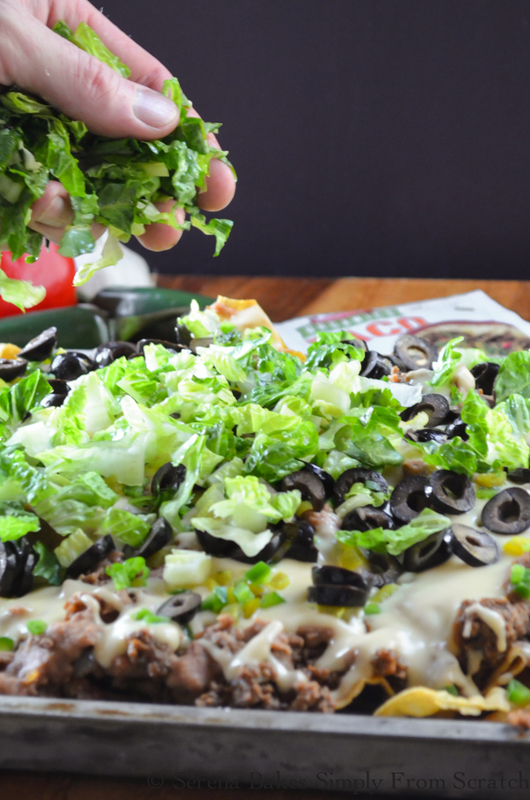 Cover with Nacho Cheese Sauce. If you like spicy Fully Loaded Nachos you can sprinkle 1/2-1 whole Diced Jalapeño and a 2-3 tablespoons Diced Pickled Jalapeños over the top. We usually will add the jalapeños this way so if anyone doesn't like the heat we can make a non-spicy section. Sprinkle 1 cup Sliced Black Olives over the top and 1 head Finely Sliced Romaine Lettuce. Add 1 whole Diced Tomato, 1 whole Diced Avocado, and a handful chopped Cilantro. Serve with your favorite salsa and sour cream if desired! Dig in and enjoy! By far my all time favorite Fully Loaded Nachos! 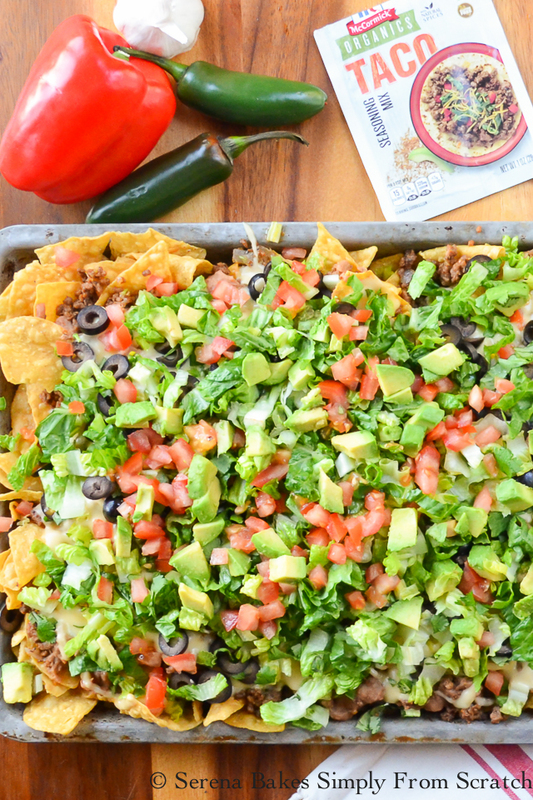 Easy to make Fully Loaded Nachos are perfect for an easy after school dinner, filling lunch or snack on game day! 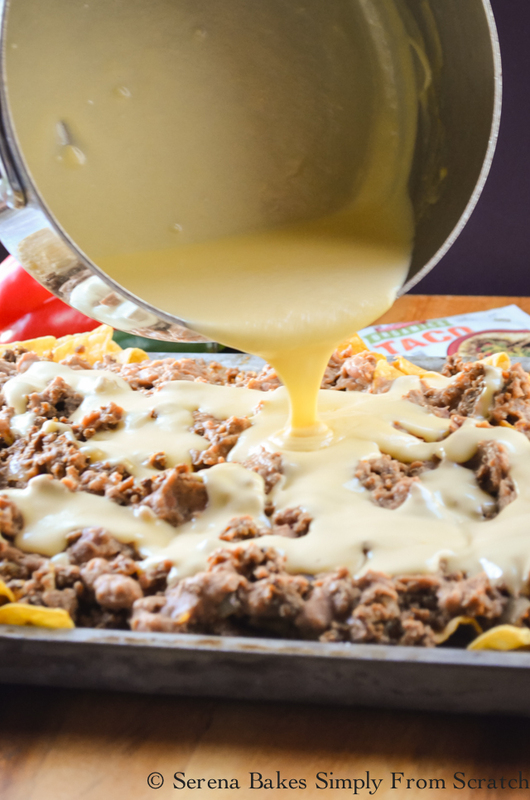 They are always a family favorite with taco seasoned ground beef and plenty of nacho cheese sauce! In a large skillet add ground beef and onion. Cook over medium-high heat until brown. 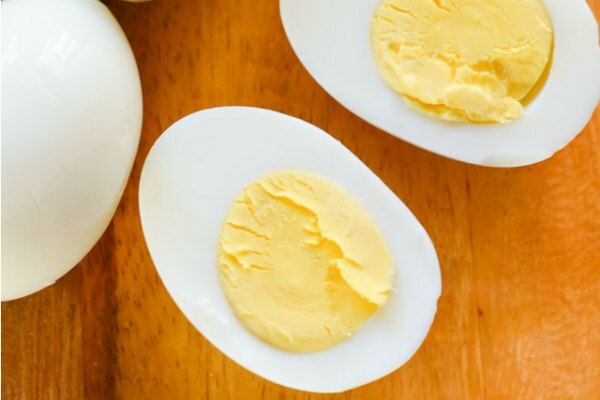 Drain excess fat. Add Taco Seasoning Mix and water, bring to a simmer. Reduce heat to low. Cook for 5 minutes. While Taco Meat cooks make Nacho Cheese Sauce: In a small sauce pan over medium-high heat add butter and cook until melted. 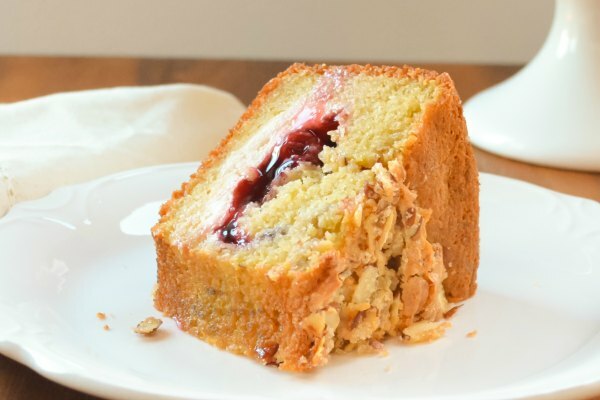 Sprinkle with flour and whisk until smooth and bubbly. Slowly stir in chicken stock and then milk. Bring to a simmer and cook until thickened and smooth about 2-3 minutes. 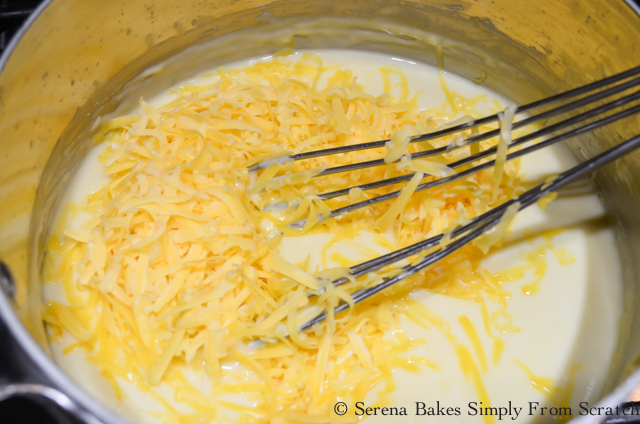 Remove from heat and whisk in grated cheese until smooth. 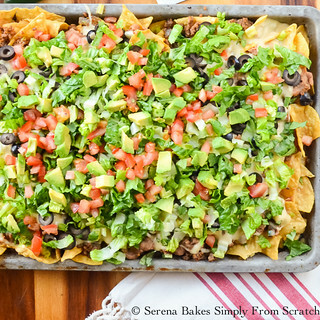 To assemble fill a large rimmed baking sheet with tortilla chips, cover with ground beef mixture, then with refried beans or black beans, cover with nacho cheese sauce, then finish layering with ingredients in order listed. Serve with salsa, sour cream, and hot sauce if desired.